Every now and then you feel as if you’ve seen everything the slots world has to offer. Not so today, though. The Colossal Fracpot slot combines the best of the progressive jackpot slots with a whole new spin – the partial cashout feature. Need we say more to encourage you to read on? 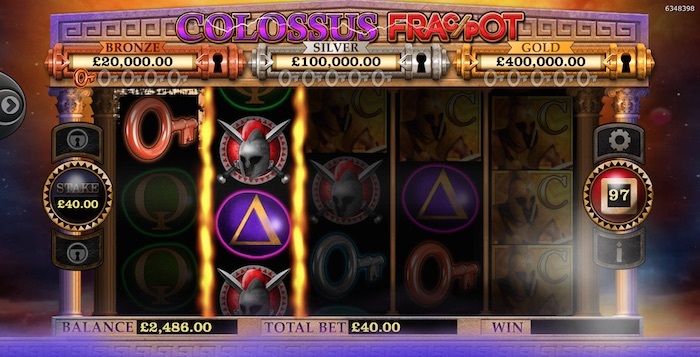 The Colossus Fracpot slot is a 5 x 3 slot game featuring 20 lines to win on. But that only covers the basics. If you love playing online slots with big jackpots, this is the one for you. The basics are pretty easy to understand, but the keys are the… er, key… to this game. I know, it sounds odd. But hopefully it will all become clear in a moment. The graphics are pretty good for the Core Gaming Colossus Fracpot game, although we’ve seen better. The design isn’t really the major feature of this game, and there are no 3D effects to be had. We’re really playing for the chance to unlock big prizes here. You can adjust your bet level on the left of the screen, or via the cog on the right (that’s also where the autoplay feature can be found). The big green button will spin the reels for you so this is all pretty straightforward. When you play the Colossus Fracpot slot, you’ll be well advised to check the payout table first. This is on the right of the screen. The first page reveals the knight-based symbols, not to mention a coin featuring a golden helmet. This has an important feature that we’ll look into in a moment. You also have J, Q, X, K and A (except A appears as a triangle in this game). So really, most of the symbols are pretty ordinary… but not all of them, as we’ll reveal now. Firstly, the Colossus Fracpot jackpot slot has a golden wild coin which replaces everything but the keys. And this is where we come to the main game feature. You can get three types of keys showing up in each spin – bronze, silver or gold ones. They’re all scatters so they can appear anywhere. You need two of one type on reels one and two to stand a chance of winning one of the Fracpots. These appear at the top of the screen. You need five keys of one colour to win that particular jackpot, BUT… we did say this had a Partial Cashout Feature. And this is where things get really interesting. When you spin two keys into position, the Fracpot event begins. Only the relevant Fracpot will stay open at the top of the screen. You will then get an offer from the game to buy back those two keys from you. If you choose to accept the offer, you will collect the prize offered to you. If you would rather gamble on whether or not the third reel will have a matching key on it, you set the amount you wish to gamble. By adjusting the scales, you can decide how much to wager. If you get it right, you then go through the same process for each of reels four and five. It’s up to you whether to cash-out part of the amount you’ve won and gamble the remainder on the appearance of another matching key, or whether you want to gamble the lot. This puts you in control, and it’s a nice feature to have. Whatever you do, you will be prompted to confirm it on the next screen. But you have to get five matching keys to win the Fracpot. Additionally, the more you gamble, the more you could potentially win. The smallest bet is 20p, which means you’re wagering a penny on each line. The biggest bet (adjustable via the cog on the right of the reels) is £40, but this can be increased to £100 when playing for the jackpot. If you went for the £100 bet you have a shot at winning the Gold Jackpot. The return-to-player is given as anywhere between 88.95% to 95.11%. This is dependent on the strategy a player uses (obviously relating to the jackpot cashout feature). It’s clear the Colossus Fracpot slot is very different from the average jackpot slot you may have come across. Indeed, as UK jackpot slots go, we think this could turn into one of the most popular ones online today. Give it a try and see if you agree. You can try it in demo mode to find out more before playing for real. It also gives you a chance to see the Fracpot gamble/cashout screen before you see it in the game (if you get the keys required to trigger this). All in all, we think this game will grab plenty of headlines.